In order to fight off murderous tendencies while doing taxes, I play video games. 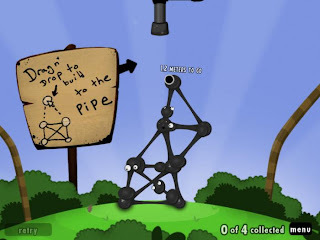 This year, I played one game on my Android phone: The World of Goo. A few years ago, I was saddened by the lack of inventiveness in new games. It seemed that every game was about the same boring plot: there were certain genres and everyone stuck to tried and tested mechanics. Walking through the aisles of a computer store, you could quickly categorize each game into a few genres: RPG, strategy, platform, with little that set the individual games apart. Compared to this, the early days of gaming were filled with creativity as programmers experimented with computers to create something fun and unique. That wasn't the only problem. I use Linux and many games do not work on my system. Even when had the luxury to install Windows on one partition, games required registration codes and other fiddling just to get working. In such unhappy times, I came across the demo for World of Goo. There was a Linux version, and I played one level or two and loved the idea behind the game. The game was refreshingly new, with goo balls sticking to one another and making cute sounds when they reached the destination. For one reason or another, I put off the purchase and then promptly forgot about it. A few weeks ago, I finally bought the first Indie bundle on Android and downloaded my copy of World of Goo. It was as refreshing and enticing as I remembered it, and so I installed it on my Android phone. Tax week was a whirlwind of administrative paperwork and an ill baby. In between copying numbers from one dull form to another, I was holding my child as he slept clinging to me. My hands were free, but I wasn't coherent enough to do anything productive. My phone was nearby, and the opportunity was perfect for the World of Goo. After a few hours over many days, I finally finished the last level. And I cried because I had no more goo world to conquer. That's how good the game is. The game has exceptional level design. Most game developers fall in the trap of coming up with a single idea for a game: developing the engine and then churning out levels one after another. In such games, the fun dries up quickly after the first few levels. The game gets devilishly hard and the levels just get tougher. New levels are more challenging, but no more rewarding. Level two is level one, but with less time and fewer resources. That's not fun, that's a chore. In Goo, you go through different scenarios, changing weather and different kinds of goo balls. The game mechanic changes as you tackle new levels. This reminds me of Soul Bubbles for Nintendo DS, which had the same change of mechanic as the game proceeded. I'm glad the developers resisted the urge to copy-paste levels. I'm glad they spent as much time in innovative levels and level mechanics as they did on the creativity of the engine. The levels are inventive, they keep you eager to see what happens next. As the game proceeds, the story of the goo balls unravels and takes the player through its strange and humorous turns. World of Goo does a lot of things well, and is an instructive lesson to the cesspool of current-day gaming. Creativity counts. Come up with something unique. Computer worlds are limitless, so don't package the same crap all over again. Entertain in every level. Each level should be fun to play. Doing the same thing twice isn't fun. Leave no player behind. Goo allows you to skip baffling levels rather than requiring your user to fight through tough levels. They can always come back for levels later. This makes the game more fun and accessible. All the fun ideas, and nothing else. The game is small, but it is fun all along. That is far better than padding a game with mediocre content to increase the length. The game is half a decade old, but is well worth playing. What is inside electronic devices?